This is my version of malay chicken curry. I like the curry quite saucy. De-stalk and de-seed the dried chillies then soak in warm water till soft. Drain of excess water. Peel shallot, garlic and ginger. put all the spice paste ingredients into a mini blender and blitz till smooth. Trim the lemon grass and bash them. Heat oil then add in the lemon grass and curry leaves, stir till fragrant then add in the spice paste and tomato puree. Stir for about 8 - 10 minutes on low heat. Add in the chicken pieces, stir for about 10 - 12 minutes. Add in about 1/2 - 3/4 cup of water, let this boil for couple of minutes, turn the heat to minimum lid on and let it simmer for 20 minutes. Add in the coconut milk, simmer with lid off for another 10 - 20 minutes till the sauce is reduced to your liking. Add salt and sugar to taste. Skimmed of any oil floating on top if you wish. Ready to eat with rice, bread or roti jala. * The skimmed oil is great for future curry cooking and anything you like to add in some curry spiced oil. * More dried chillies more spicier the curry and redder the sauce. * If you don't like it too spicy and want a redder sauce, add more tomato puree. I know you are a curry fan. Hope you will try this, it's rather nice. If your husband does not like shrimp paste can leave it out just a bit plainer. 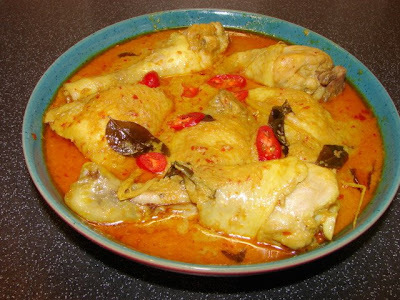 This recipe is very similar to chicken kapitan (a Nyonya curry).